Do you love fried breakfast potatoes? 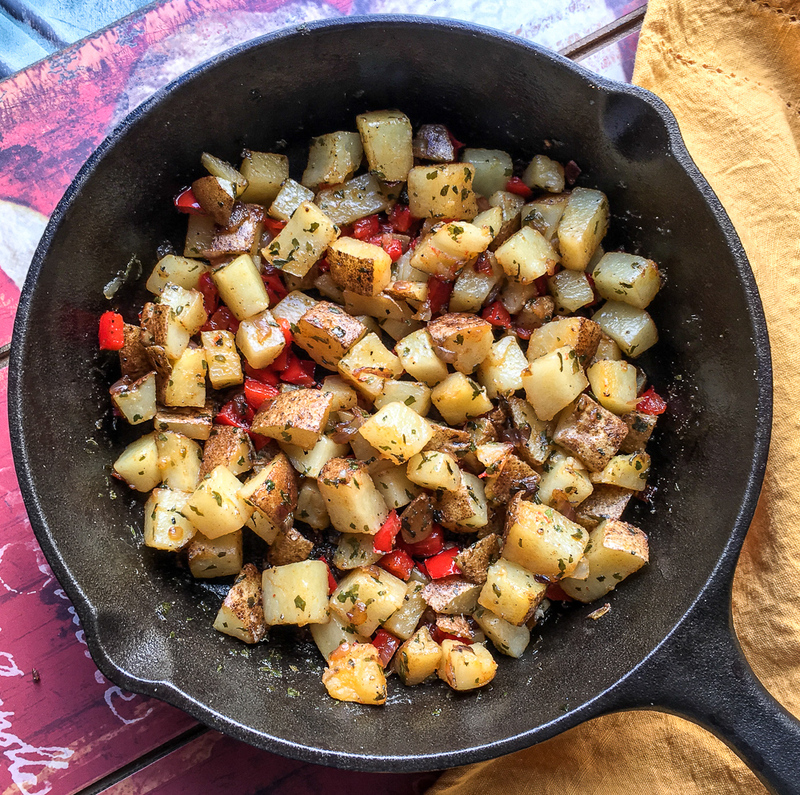 Want to make great tasting breakfast potatoes at home? These potatoes taste like the potatoes you get when you go out to eat for breakfast. Learn how to make fried breakfast potatoes. I love me some fried breakfast potatoes. I have to say I am really spoiled. My husband makes me breakfast almost every day and he makes the BEST fried breakfast potatoes. I have been asking forever to tell me how to make fried breakfast potatoes and he wouldn’t tell me. He wanted to keep the secret to himself. Finally, I convinced him to not only tell me how to make breakfast potatoes but to share it with all of you. Breakfast potatoes are just what it sounds. They are fried potatoes that are usually served with breakfast. They are very popular at diners and places or restaurants. I swear it is the best part of breakfast. But for some reason, my potatoes never came out tasting like the diners. Then Don showed me how. What to Serve with Fried Breakfast Potatoes? Breakfast potatoes are perfect for any type of breakfast. It pairs perfectly with eggs and bacon. 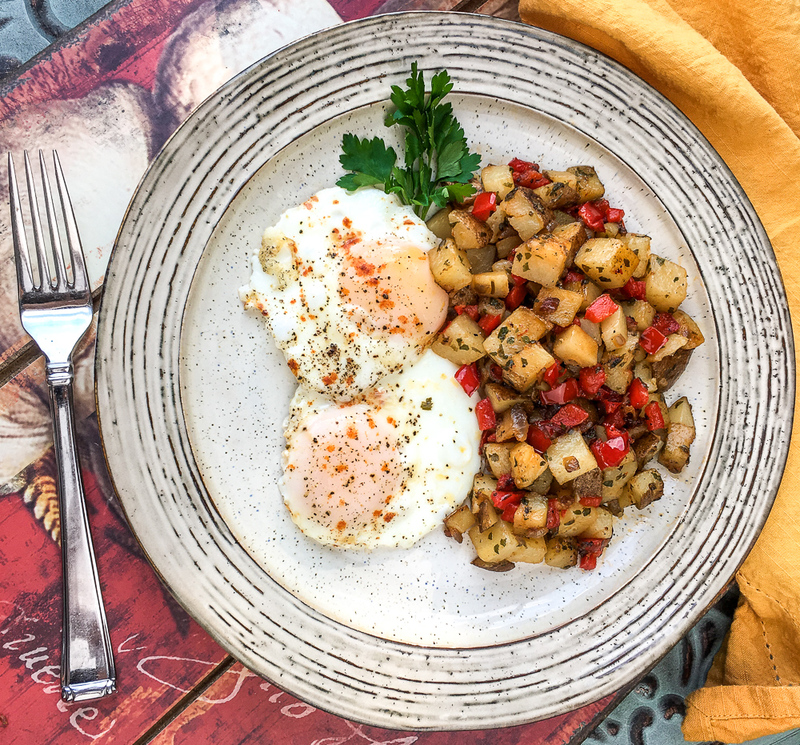 While it might seem like a carb overload, you can serve fried breakfast potatoes with pancakes and French taste as well. Honestly, these potatoes are so good, you can eat them by themselves. More Breakfast Ideas. Pair with these with fried breakfast potatoes or make by itself. 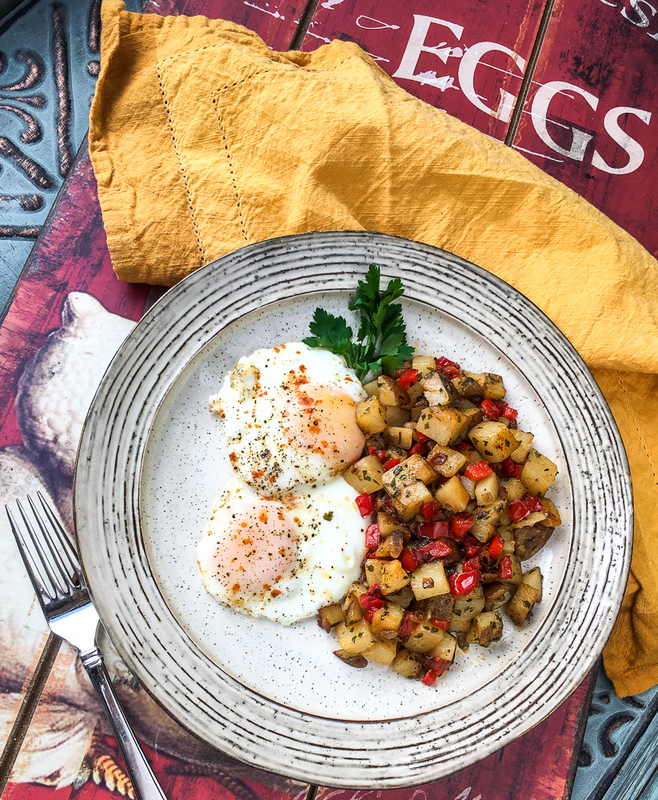 When you make these breakfast potatoes, with a few changes these potatoes are 4 points per serving. Add potato and water to a large microwave-safe dish and cover. Microwave on high for 3-4 minutes, or just until potatoes are crisp-tender, but not mushy. Do not overcook. Meanwhile, heat olive oil in a large cast iron skillet over medium heat. Add red pepper and onion and sprinkle with garlic powder, parsley, rosemary, and smoked paprika. Season with salt and black pepper, to taste, and stir to combine. Cook, stirring frequently until the pepper and onion soften and develop a bit of color, approximately 3-4 minutes. Drain excess moisture from the potatoes and pat dry. Transfer to the skillet and season with additional salt and black pepper, as desired. Cook, stirring occasionally, until the potatoes are golden brown and slightly crispy, approximately 6-7 minutes. Season with additional salt and black pepper, if desired. Remove from heat and sprinkle freshly grated Parmesan cheese on top of the warm potatoes. Cover just until the cheese melts and serve immediately. Enjoy! Wondering how to make fried breakfast potatoes? 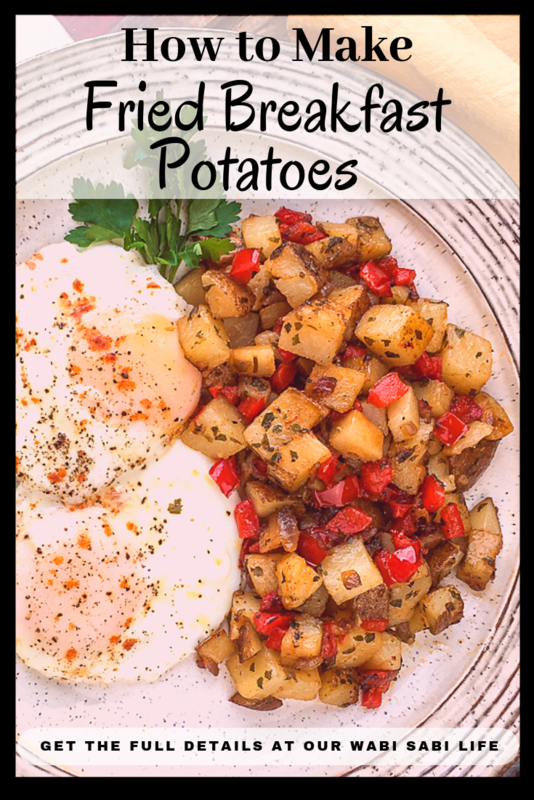 Want to make great tasting breakfast potatoes at home? These potatoes taste like the potatoes you get when you go out to eat for breakfast. Add potato and water to a large microwave-safe dish and cover. Microwave on high for 3-4 minutes, or just until potatoes are crisp-tender, but not mushy. Do not overcook. Meanwhile, heat olive oil in a large cast iron skillet over medium heat. Add red pepper and onion and sprinkle with garlic powder, parsley, rosemary, and smoked paprika. Season with salt and black pepper, to taste, and stir to combine. Cook, stirring frequently until the pepper and onion soften and develop a bit of color, approximately 3-4 minutes. Drain excess moisture from the potatoes and pat dry. Transfer to the skillet and season with additional salt and black pepper, as desired. Cook, stirring occasionally, until the potatoes are golden brown and slightly crispy, approximately 6-7 minutes. Season with additional salt and black pepper, if desired. Remove from heat and sprinkle freshly grated Parmesan cheese on top of the warm potatoes. Cover just until the cheese melts and serve immediately. Enjoy!